The heart is the engine of our life. It is located in the centre of the chest and it is about the size of a fist and has a mass of between 260 grams in females and 350 grams in males. It is divided into two halves by the septum. Each half consists of two chambers, a superior atrium and an inferior ventricle. The atria are the receiving chambers for the blood flowing back into the heart. From the atria the blood flows into the ventricles, which are the pumping stations of our cardiovascular system and whose function it is to supply the vessels (arteries, veins, and capillaries) with blood. Arteries are vessels that carry blood away from the heart, whereas veins carry blood towards the heart. 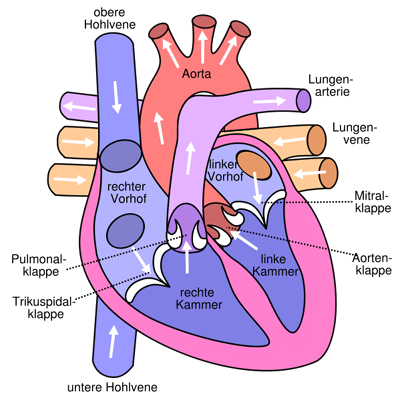 Exchange of oxygen and nutrients to the organs and tissue takes place in the fine capillaries connecting arteries and veins. The internist/physician is a medical doctor specialized in internal medicine. This area of medicine focuses especially on the heart, the circulatory system, the alimentary organs, the kidneys, the blood and the hematopoietic organs, the vascular system, the metabolism and the hormonal glands, the immune system, infections, poisoning, tumors and other malign diseases of the hematopoietic system. The cardiologist is a physician dedicated to the heart and the large blood vessels in the thoracic cavity lungs. Angina pectoris, heart attacks, high blood pressure, shortage of breath, arrhythmia among others are core areas of treatment. Malnutrition and the lack of physical activity are the causes of excess weight, diabetes, high blood pressure and lipometabolic disorders. These factors combined with the intake of nicotine are the primary health conditions of our society and are thus often responsible for premature death. Among other problems, these conditions damage our blood vessels (arteriosclerosis) and might lead to cardiac arrest or strokes. The more and the longer one exposes oneself to these risk factors, the higher the risk of such medical conditions. In view of this, the number of obese teenager and children with diabetes and high blood pressure is alarming, since they are at risk from a very young age onwards. Later in life, time pressure and work stress contribute their share to the increased risk of heart conditions and often preventive care is just forgotten in the course of dealing with the struggle of survival in our daily life. Almost everybody knows a friend, colleague or relative who died from cardiac arrest or just survived a heart attack. Cardiologists are frequently only consulted when it is too late. A heart attack leaves heavy psychological marks behind, not to mention the physical impairment caused by cardiac insufficiency, cardiac arrhythmia or the side effects of the indispensable treatment with medicines. It is crucial to intervene by means of preventive care as early as possible and to come up with the adequate strategy aimed at reducing the risk of cardiovascular conditions for any risk patient. The prerequisite for this consists of a careful analysis of the individual’s risk and a thorough cardiologic examination. Following this, the patient should be advised on diet, stop smoking approaches and adequate physical exercise. These will serve as the basis for staying healthy in the long run.